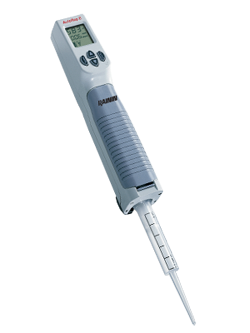 The AutoRep E (electronic) and AutoRep S (manual) are precise, accurate repeater pipettes that save time, with ergonomic features that reduce user fatigue. Flexible volume ranges and a wide selection of quick-change positive-displacement syringe tips ensure precise performance on any aliquot volume from 1 μl – 50ml. (AutoRep S manual version, aliquot range 2 μl – 5 ml). AutoRep E is micro-processor controlled, for highly precise repeat pipetting with negligible user pipetting forces. "Dispensing", "Auto-Dispensing" and "Pipetting" modes and a “Learn” function make AutoRep ideal for many research activities. No guesswork or volume setting errors as the electronic AutoRep E model “reads” the volume of each Encode syringe tip. Order Information: Electronic version, 1 µl – 50 ml, including battery pack, recharging base, AC adapter, and one of each Encode syringe tip: 0.5, 1.25, 2.5, 5, 12.5 ml. AutoRep S: Lightweight ergonomic manual version. Easy volume setting using the supplied volume setting card. Comfortable and simple to use for up to 49 pipetting steps/doses without refilling. Order Information: Ergonomic manual version, 2 µl – 5 ml, including shelf mount bracket and 2-sided volume setting card, and one of each Encode syringe tip: 0.1 ml, 1 ml and 10 ml. Syringe Tips: High-quality pre-assembled positive-displacement syringe tips are available in 10 different sizes, in both sterile and non-sterile formats. This manual provides a complete overview of the operating instructions for the AutoRep™ E.
This manual provides a complete overview of the operating instructions for the AutoRep™ E Repeating Dispenser. This manual provides a complete overview of the operating instructions for the AutoRep M Pipette. This manual provides a complete overview of the operating instructions for the AutoRep™ S.